E-Documents allow the patient to fill out a form while in the virtual waiting room, and electronically sign it. Users with an Account Administrator or Clinical Supervisor role can create/edit as many templates as needed, and delete templates as well. Common uses for these E-Documents include Statements of Understanding and intake forms. As the session host, you will be notified by e-mail that you have received a document (the name of the document will be included in the email but not the name of the person that signed it), and can log in to access it. This support article illustrates how to access an E-Document that has been submitted to you. 1. Underneath the meeting panel is a "Session Documents" section. Any completed documents will appear with a "View" button to the right. 2. Scroll to the bottom of the next page. < Back: this will navigate back to the page you came from. Add Your Signature: this will add an electronic signature displaying your username on the document. Download PDF: this will download a PDF copy of the document. 1. 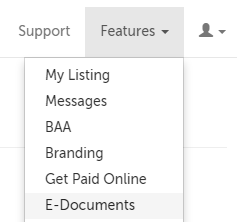 Click on the "Features" tab and select "E-Documents" from the drop-down menu. 2. If you have received any documents, they will be listed on the next page. Use the "View" button next to the document you want to view. "Sent by": this is the name of your participant as you have entered it on your Dashboard. "Name on E-Signature": this is the name provided by your participant on the form. 3. Scroll to the bottom of the next page. This action requires the "Clinical Supervisor" role. 1. 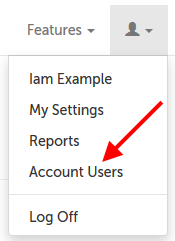 Click on the profile icon in the upper-right hand corner, and select "Account Users". 2. Click on the "E-Documents" button in the same row as the user whose documents you want to view. 3. If this user has received any documents, they will be listed on the next page. Use the "View" button next to the document you want to view. 3. If desired, you can use the "Download PDF" button at the bottom of the viewing page to generate a PDF version of the document. 1. 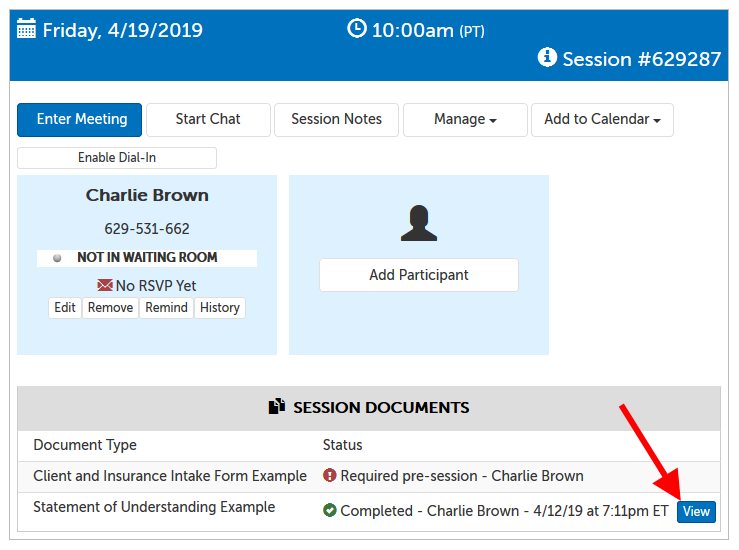 If you have access to view documents assigned to other participants in the session, you will see those documents and their statuses from your own waiting room page or dashboard. Click "View". If there is no "View" button, that participant has not completed the document yet. 2. Review the document, and then scroll to the bottom of the page and click "Add Your Signature" when ready. You can also click on "Download PDF" to download a PDF copy of the submitted document, before or after you add your signature. This article was last reviewed by our Support team on April 15, 2019.